An injury to your mouth can be a painful, expensive experience. For athletes, mouth and tooth injuries pose a very real risk. Mouthguards are an excellent tool for protecting your mouth from injury and harm. Our team can help you find a solution that protects your teeth. Mouthguards protect your teeth. For athletes who play contact sports, injuries to the mouth can cause cracked teeth, or even worse, missing teeth. Mouthguards defend your teeth against such injuries. But mouthguards aren’t only for teeth. Your mouth is mostly made up of soft tissues, such as your tongue, inside cheeks, and lips. These areas can become injured or pierced when playing sports. High-contact sports such as hockey, wrestling, football, and boxing pose the greatest risk for mouth injuries. But all athletes can benefit from being cautious. Gymnasts should consider wearing one to protect their mouth in the event of a fall. Baseball and basketball players should also wear one to protect themselves from being injured by a ball or collision with another player. 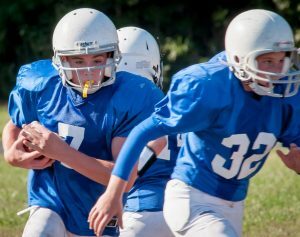 Mouthguards should be treated as a necessary piece of your athletic gear. Our team can help you find the best mouthguard during your next visit to our office. There are a number of options available ranging from store-bought ones to custom-fitted mouthguards. We will work with you to determine which type of mouthguard is best for you. It is important that any guard fits properly. We can also work with you if you are currently undergoing orthodontic treatment and are wearing braces. Braces can puncture your mouth if impacted, particularly during sports. Our team will help you find a solution that works. Your mouth should be protected while participating in athletic activities. Oral injuries can make eating, drinking, and talking difficult. Protect yourself from an injury before one happens. Contact our office and ask about finding a mouthguard that is right for you.